The overwhelming majority of adults in England are so unhealthy they put their lives at risk, a survey suggests. The data from the Health Survey for England showed nearly nine in 10 had at least one unhealthy trait. That was classed as those who smoke, drink more than 14 units of alcohol, eat fewer than five portions of fruit and vegetables, are obese or have low rates of physical activity. Half of adults have two or more of these risk factors. Although there are signs some people are giving up some of the unhealthy traits. 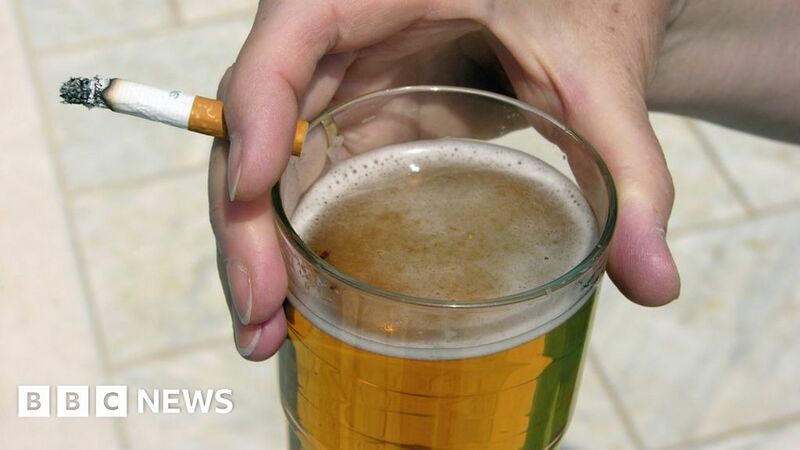 The survey from NHS Digital has been published as the Office for National Statistics revealed the latest death rates linked to alcohol. In 2017, nearly 7,700 people died in the UK from alcohol-specific causes – where the death was wholly attributable. That is the equivalent to 12.2 deaths per 100,000 people – the highest rate since 2008. Of the four UK nations, Scotland had the highest rate. What else has the survey suggested? The annual survey asked 8,000 adults and 2,000 children about their lifestyles. For the first time, it has compared the lifestyles of children with their parents. It suggested children who have obese parents were around three times more likely to be obese than children of healthy weight parents. Some 28% of children of an obese mother were also obese, compared with 8% of children whose mother was a healthy weight. Meanwhile, 24% of children of an obese father were also obese, compared with 9% of children where the father was not overweight or obese. Caroline Cerny, of the Obesity Health Alliance, said the findings highlighted the need to tackle the “increasingly obesogenic environments”. Yes. Cigarette use is falling. In 1993 27% of adults were smokers, last year it was down to 17% with growing numbers turning to vaping. Drinking alcohol to excess is also down. It means the most common unhealthy lifestyle trait is low fruit and vegetable consumption. Although there are high levels of unhealthy lifestyles, around four in 10 adults have no signs of ill-health developing yet. This was classed as conditions such as high blood pressure and raised cholesterol levels. There are also strong signs that children are becoming healthier – or at least demonstrating less risky behaviours. Last year just 5% of eight to 15-year-olds had tried smoking, down from 19% in 1997. The numbers trying alcohol have dropped from 45% in 2003 to 14% in 2017.